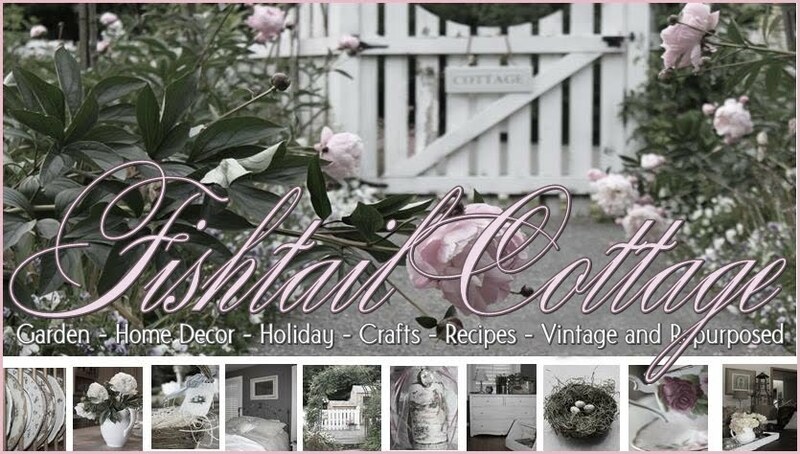 Fishtail Cottage: The beginning of spring… "
So I’ve been trying very hard to get this Party started! 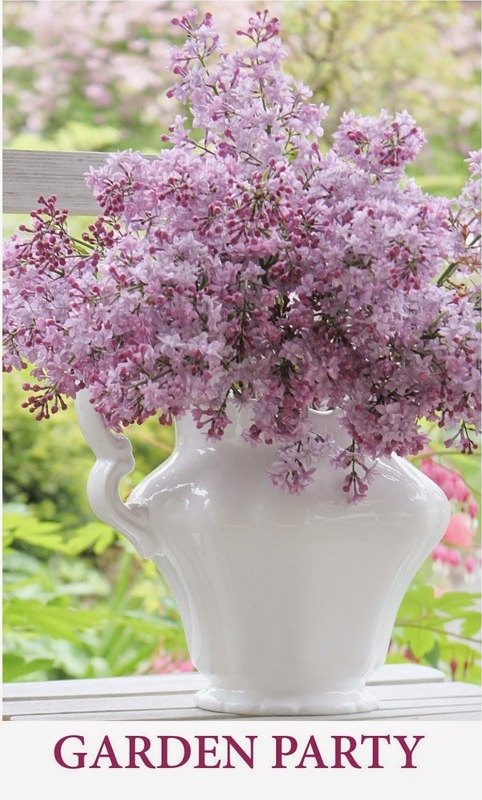 The spring party of finding ways to bring some cheerful blooms to my home. As different pretty flowers have been arriving in the grocery stores, I’ve been picking a few things up and potting them inside ~ however, the blooms only last about a week inside and then need to be moved outdoors. Right now I have hellebores inside! Also almost in bloom are more daffodils ~ I line the pots in garden catalogue paper to help keep the pots from drying out inside. Last week I had primroses adorning my indoor garden pots! and now they have been moved to my front porch planter accompanied some Northwest moss and crocus bulbs that are beginning to emerge! Yesterday I had breakfast with a girlfriend and then headed out to McAuliffe’s Nursery in Monroe Washington to take a peek around. I ended up purchasing this darling garden apron and a few plants (Neon Rose Mossy Saxifrage and Flore Pleno Double Snowdrops) with the gift card she gave me last October! Looking forward to getting out in the garden soon. I understand exactly what you mean - it's difficult here, also, to get motivated as it is cold, dark, rainy and bleh today! BUT I have been trying! Hellebores are my favorite this time of year! It's so nice that you have some things blooming indoors, Tracie! I like how you used the seed catalogs for drainage. And the apron is darling! I haven't checked out back to see if I have any shoots yet, it's all mud! i really like the hellebores and the all white decor around them! It is beautiful. I have been enjoying blooms for a couple of weeks now and it has been wonderful. I love your rusty chippy plant stand Tracie. I enjoy spring blooms and colour inside now too. Happy Spring to you! Oh they look so pretty and promising. We are nowhere near ready for that yet. Scuttlebutt has it there is a storm coming tomorrow...but I am convinced it will pass us by. I am just so ready for spring! I've been walking around the gardens to see what is starting. The tulips, daffodils, hyacinths, alliums, and some other unknown bulbs have all started. I love your planter that you moved outside. I have one very similar to that and you have given me some inspiration as to what to do with it, thank you for sharing. I do the exact same thing! The plants jump in my basket in the store and then I keep them in the house for as long as possible before putting them outside. Tracie, I have been thinking about you lately and that it won't be long till your Garden Party starts. Can't wait! Has felt like Spring here lately and I am loving it. Been working like a horse in the gardens. Love your indoor displays. Lining the pots with paper not only is a great idea, but looks cute also. Love, love your rustic planter! I love Hellebores. Have three coming up outside. Yours are beautiful in your urns. Thanks for the vintage candle holder. Hope you received my check. Been meaning to hop over. Sorry I am slow! We're still being hit by Old Man Winter so it will be a few more weeks before I can think about gardening outside. Can't wait.....but that's the joy of living in Canada. Beautiful flowers, Love from Michigan. I can't get motivated with spring, it just snowed last night and with packing to move there are boxes everywhere. sure signs of le printemps all around you! we just got a half foot of snow! ugh! so can;t wait for the buds & birds to appear!! I'm looking forward to our first day of spring too... my daffodils, hellebores, muscari and hyacinths are all in bloom... YEA! Our weather today is gorgeous, but rain and in the 40's tomorrow. Lovely to keep these blooms indoors to enjoy until warmer weather arrives...so beautiful. Happy to be your newest follower! !